Telling a good story—one that keeps readers turning the page and burning the midnight oil—doesn't just happen. Creating a plot is both an art...and a method. LitCourse 6 examines some of the specific tools writers use to develop their storylines. William Faulkner—"A Rose for Emily"
How hard is it to tell a good story? Well, here's a little thought experiment. Has this happened to you? You corral your friends together to tell them about a dream you had the other night. But wait...you're not half-way through when you begin to notice eyes glazing over. They're bored? How could they be? The dream was... incredible! Huh. Maybe it's how you're telling it. Storytelling is an art, and much depends on plot, the way events in a story unfold. In this course, we'll examine basic plot conventions, which authors follow to construct their stories. We'll look at . . .
Revelation—the information revealed to readers. Exposition—background information; usually at the beginning, but not always. Rising Action—series of events involving conflict, which creates tension and suspense. 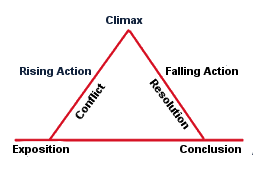 Climax—the peak, or high-point, of tension, a turning point in the action. Denouement—the falling-off of action after the climax; the conflict finds resolution. Notice how Faulkner's "A Rose for Emily"—the story for this course—departs from the classic pyramid. 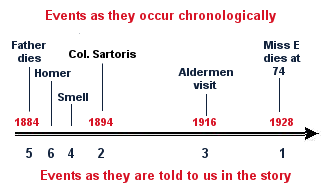 Chronology is the timeline of a story's events—the order in which events occur. Linear time—forward forward movement of time; events move from past to present. Non-linear time—forward and backward movement of time. The telling of events is disjointed, jumping back and forth between past and present. "Well, this happened...but before that, this happened...."
Realistic fiction tends to use a straightforward timeline, or chronology, moving from past to present. Faulkner's story, however, uses a nonconventional timeline, starting—and ending—with Emily's death. The clash of opposing forces creates conflict. Conflict creates tension, and tension creates suspense, the thing that keeps us turning pages. There are two types of conflict. Most authors use a combination of the two. External conflict: pits characters against . . .
• nature—weather, disease, natural landscapes, or natural disasters. Authors frequently use a combination of internal and external conflict in the same story. What do you know . . . and when do you know it? That depends on revelation. Exposition—an explanation providing background information—events that occurred prior to the onset of the story. It may come from a narrator, dialogue, or a character's internal thoughts. Usually, but not always, at the beginning. Flashbacks—also provide background information. They differ from exposition in that they take the form of an actual re-enactment of events. They come from characters' dreams, reveries or memories. Foreshadowing—an event or piece of dialog that hints at what is to come, a precursor or "pre-echo" of future events. Foreshadowing is subtle, often more obvious in hindsight or upon re-reading. Suspended revelation—authors withhold (or suspend) information to create suspense and surprise. Readers know only what the author wants to reveal...and when. Mystery plots are based on this technique, but all stories use it. LitCourse 6, click "Reading" in the Course Tools menu.